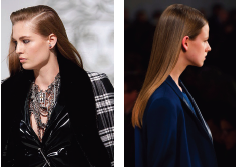 › Look closely at the Versace hair and you’ll discover the subtle rock’n’roll detailing. “I combed up the front to make it a little more boyish, a little tougher,” Guido said. Blow-dry with satinwear 02 prepping blow-dry lotion, then create a clean side part and use hardwear 16 super strong gel to comb the front up and into shape. Finish with forceful 23 super strength finishing spray. › The subtlest of matte finishes gave the blowouts at Reed Krakoff a second-day look. Shampoo and condition with Diamond Oil, then blow-dry with a round brush, letting each section cool on the brush to add movement. Finish by misting powder refresh 01 aerosol hair powder/dry shampoo on hair’s lengths for a “lived in” texture. ← NEW! Pureology Pure Volume System!